Samantha & Ryan braved the rain and got married out doors at Willow Park Golf Coarse. They waited for the staff to dry off the chairs so their guests could be seated and the service began with Nomi Whalen as their marriage commissioner. The service was wonderful with Ryan in tears as he saw his bride Samantha for the first time walking down the isle. There was soon smiles and laughter as the service continued and cheers when they were finally pronounced man and wife. As we started with the family photos and then into the wedding party and couple at the Golf Coarse, it started to rain again so we broke out the umbrella's and kept on going. So much laughter and fun in the rain. We then rushed off to Lake Bonavista for more photos at the lake just the bride and groom with the wedding party. The rain let up and we were able to have some fun with the party. Along came the rain again so we headed back to the golf coarse. 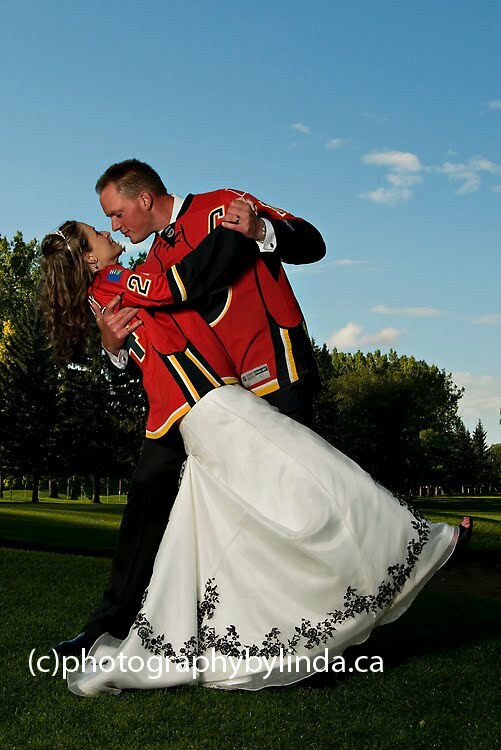 The couple and the party put on their jersey's as they supported their favorite team Calgary Flames for some fun wedding photos. Soon it was time for the reception where the bride and the groom left for a fabulous evening of food, drinks good company and a dance.